Tom at the Bell Street entry of the Lovers Lane Trail 2018. Webster Springs, a small isolated mountain town in West Virginia, has recently reopened a river side boardwalk that was part of the community over 100 years ago. Lover’s Lane Boardwalk has been rebuild and is free and open to the public. The 3/4 mile path winds its way from downtown Webster Springs along the Back Fork of the Elk River ending at a small park area and a historical swing bridge. Looking back from the boardwalk to the 1st swing bridge and the town of Webster Springs. Long straight away along the Lover’s Lane Board Walk with a over look spot. As a lover of West Virginia culture and history I really wanted to see the boardwalk. Originally built just after the Civil War in 1875 and reconstructed 1890 the boardwalk was in use until the 1940’s. It lead visitors down a path from a old Victorian boarding house and grist mill to downtown without having to pass through the mud and dirt of the street. I also wanted to see for myself if the name Lover’s Lane was even appropriate. I’m not a huge romantic type so calling a wooden walk way “Lover’s Lane” is a bit of a stretch for me. But this is one place that the name fits and you feel the passion and beauty of nature all around you. 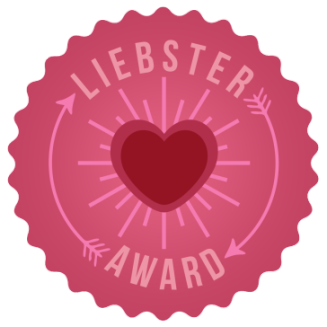 The deeper you go into the woods the more you travel back in time and surprisingly find yourself in love, maybe not with the person you are walking with, but the whole idea of Dr Gillespie’s project. An unexpected find along board walk a water value found at the base of Beech tree. ice and moss found on rocks along the lovers lane board walk. The reconstruction of the 3/4 of a mile boardwalk was the passion of local resident and retired University Librarian Dr. David Gillespie. Who has purchased most of the land along the river where the boardwalk runs and has over seen all of the construction and funding for the project. He also has encouraged the use of the land at the end of the board walk as a park by adding a wooden walking bridge onto a low water island along the river. Lover’s Lane Bridge and island park. In addition to the short 3/4 mile boardwalk at each end of the trip is a historic swinging bridge crossing the Back Fork of the Elk River. Then a paved sidewalk to the main street area of downtown Webster Springs making the the walk about a 2 mile loop. Where in warmer weather you can find ice cream, sandwiches and CVB office open. Christopher trying to keep him balance on the 2nd of two swinging bridges. Christopher and I getting ready to head across the second swinging bridge. View from the swinging bridge over the Back Fork of the Elk River. We took our walk in the month of Dec. maybe not the most beautiful time of year for a trip to Lover’s Lane but a wonderful time to get out of the house to beat back cabin fever. I plan to come back to the board walk in May to enjoy the rhododendrons and leaf cover of spring. I am hoping to share the experience with my grand-daughter who loves to be outside and hike with me. I think Christopher and Paige will really enjoy the bouncy walk across the bridges together. Holiday Decor on hog pen along the path of the Lover’s Lane Boardwalk Trail. Hog pen along street along the Lover’s Lane Boardwalk trail. To find the board walk you can park downtown in the town of Webster Springs and find the beginning at Back Fork Street across from Minnich’s Florist or you can try to park along Bennett Ave, but this is not advised as their is no real parking on this residential street along the river. The best parking is at the head of Bell Street about 7/10 of a mile from downtown. The parking is Handicapped accessible with the small island park and one of two of the swinging bridges. To get to the boardwalk from here you head towards town and pass a few residential houses and buildings. If you need more information about the history of the boardwalk, the Grist Mill or Boarding house that were at the head of Lover’s Lane please contact Dr. David Gillespie at 681-213-1205. Coming Home to West Virginia; Saving a 1860’s Family Home. “Coming home to West Virginia” is how David Cutlip described the adventure of saving his Great Grandfather’s log cabin constructed in the 1860’s. The story spans 4 generations, crosses state lines and brings new life to a beloved log home. The Cutlip Reconstructed 1860’s cabin in Beverly, West Virginia. This story begins along a rural road in what is now Webster County, West Virginia with Marion Wilson Cutlip who built a log home in the mid 1860’s. The cabin is made from hewed poplar logs that grew on the 250 acre farm near the community of Hacker Valley. 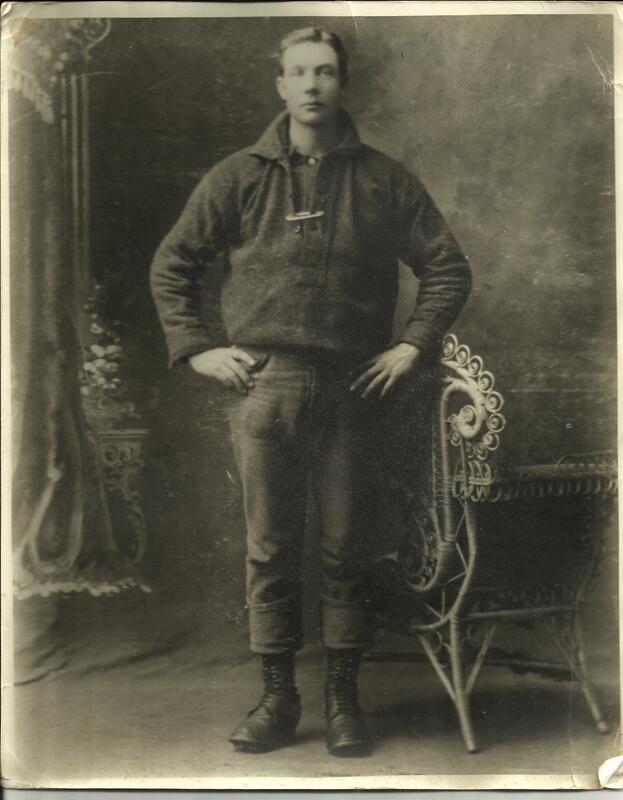 Marion,his wife and four children were the first to call the cabin home, but not the last.Little did Marion know that he had creating a home that would last for over 150 years and would pass to his Great Grandson. Living and working the land as farmers,the family eventually out grew the small log home that measures only 16′ x 23′ feet. So, in the early 1900’s additions and siding were added, hiding the hewed logs from view. In the 1970’s, the house was no longer occupied daily and this is how it appeared for the remainder of the years it sat on the farm. Cutlip family home Webster County, West Virginia 1860’s before moving the logs to Randolph County, West Virginia in 2007. Years passed, the farm and home were eventually sold out of the Cutlip family.Times change and members of the family moved away from West Virginia looking for better opportunities, including Davids family. 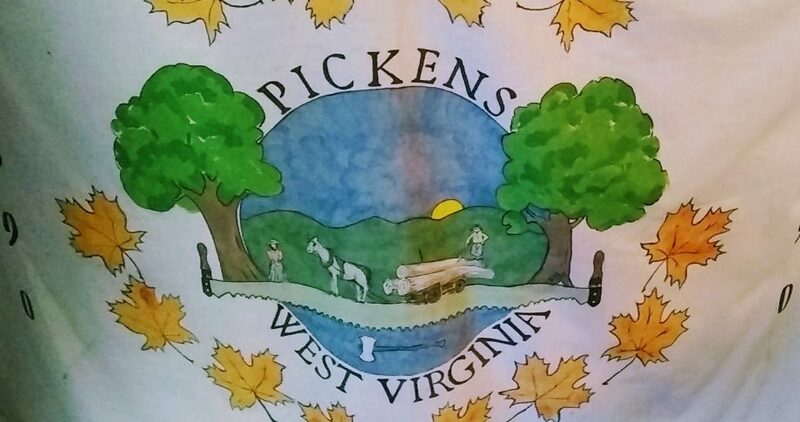 David returned to West Virginia to attend college at Davis and Elkins College, and visited the old home place many times while a student. His love of family history and the families ties to the house continued to grow until adulthood. While living and working in Ohio, he never forgot the house from his childhood or the way West Virginia made him feel. In 2007 the farmer who then owned the house allowed Dave and his wife Patricia to purchase the home back and the real work began. After tare down and the reconstruction of the Cutlip log home with help from Mark Bowe. By the end of 2009 David and Patricia began the work of finding out if the logs of the house were salvageable. As with all houses of this age, water and bugs (termites here in W.V.) can wreak havoc on old logs. With some searching the couple found a nice location for the future log home outside the small town of Beverly, West Virginia. 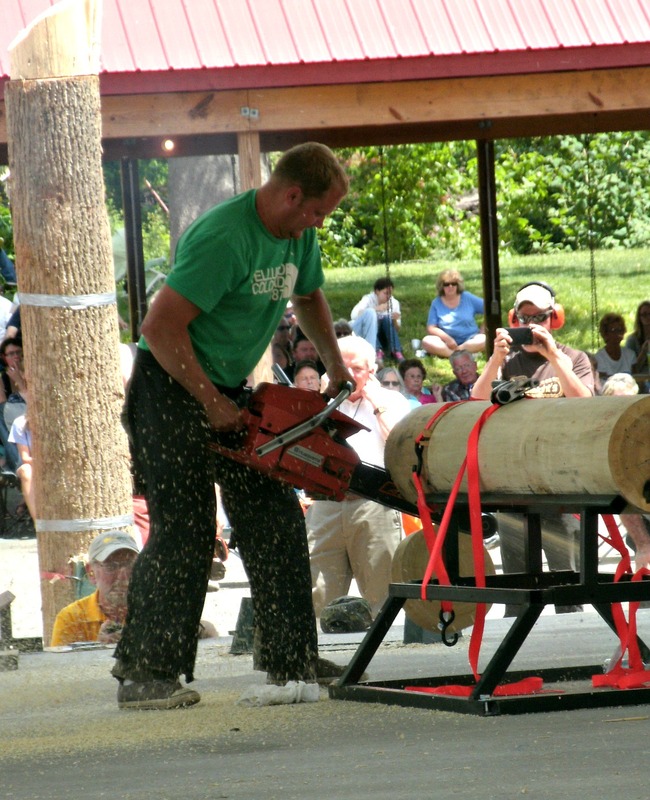 Then they found Mark Bowe the owner of “Antique Cabins and Barns” in Lewisburg, West Virginia who would be charged with dismantling and moving the heavy logs. Mark Bowe (before “Barnwood Builder” Fame) found the project promising and within a few months had his crew (some that are still members of the “Barnwood Builders” television show today) dismantle the house. By the end of the first week the 150 year old logs were dismantled, loaded and trucked away to a storage yard in Lewisburg, WV. Nearly two years later Mark and his crew delivered the logs from the Lewisburg log yard to the new home site where a new foundation had been constructed.The work to construct a new log home continued over the next 5 years. As this was not David and Patricia’s primary home they took their time to make their dream retirement home come true. In the end the home is the perfect balance of old and new features,that keeps its warm rustic appeal. To the log home,the couple added space to the small original floor plan. They added a modern kitchen, dinning room,a study, two bathrooms and quest room to the design. They were able to keep the historic feel by reusing many of the features from the log cabin, such as the hearth stone and fire-place surround that David remembers as a child. Dave and Patricia have added antiques and family heirlooms to the decor of the home.These additions make a warm and inviting space that honors the generations of his family that worked the land so hard to create this log home. Living room with Hearthstone and fireplace surround from original house build by David Cutlips Great Grandfather in the 1860’s. Modern Kitchen addition added to the Cutlip/ Mayes home with a light and airy feel. Gas log fire-place behind antique farm table in modern addition of the Cutlip/Mayes log home. Master bedroom with sitting area in 1860’s portion of the house. David and Patricia have collected a verity of antiques to decorate their home. 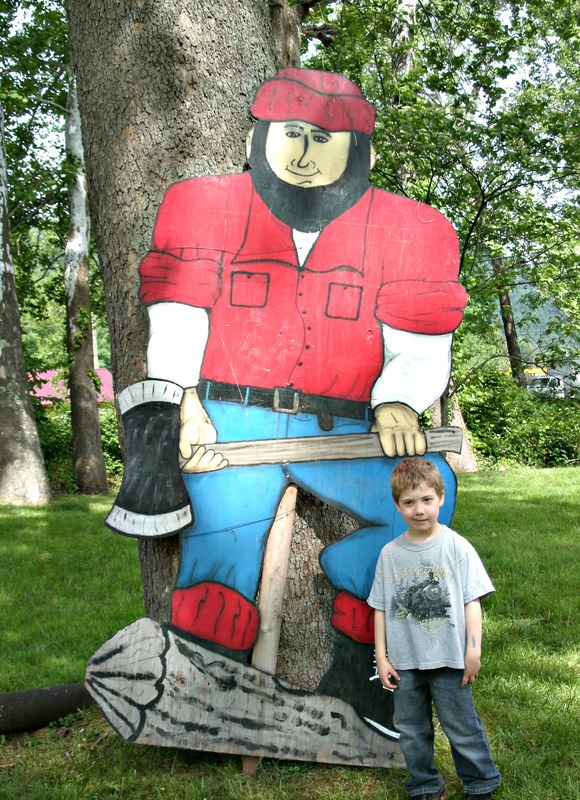 With two interesting items that stand out when you spend some time in the log home. One is Davids Grate Grandfathers desk that was made on the Webster County Farm and the Linsey- Woolsey coverlets that his Great Grandmother wove from flax and wool from the family farm in the late 1800’s. Hand made desk made by Marion Cutlip in Webster County, West Virginia. Shown in the home of his Great Grandson David Cutlip, Randolph County West Virginia 2017. It is heartwarming to know that both of these wonderful heirlooms were not only made by his family on the farm, but were made from products on that farm. The desk is made of poplar planks that were milled from trees that grew in the woods of the Webster County farm. Marion Cutlip designed and constructed this desk to be used in this very same house. David said after our tour that with 6 people living in the 2 story, 16’X 23′ log cabin together “He thought that this desk was about the only space that his Great Grandfather had in the entire house”( and I do not doubt him one bit). The coverlets were made by Davids Great Grandmother. The family produced the wool from their own sheep and grew the flax that would be spun into linen for the coverlets.I was amazed at the coloring and detailed patterns of the Linsey-Woolsey blankets and can only imagine the time it took to make just one of these covers. In more modern times families who used this type of fabric and dressed in the bright patterns and plaids that could be woven on a family looms were thought to be poor. As the rich were able to buy fine imported materials from Europe. Today, any person who could master this art would charge highly for their fabrics and would be looked at as an artisan of the highest order. The skill of making your own fiber and fabric is a tradition that is long-lost in our day and age. My visit to my friend’s home was such a wonderful learning experience. My family and I took away lots of great ideas for our own home remodel. We got to hear some wonderful stories about the people and history of our state and were reminded that it is possible to bring together the past and the present and make a dream come true. David Cutlip and his wonderful wife Patricia Mayes have saved not only an old house from further deterioration but made a beautiful home from the dreams of a young man many miles from where he called home. Living in a state where natural resources drive the economy, we see more than our fair share of loggers, forester, natural gas and oil drillers and coal miners. Many of us live off the land in more ways than one. 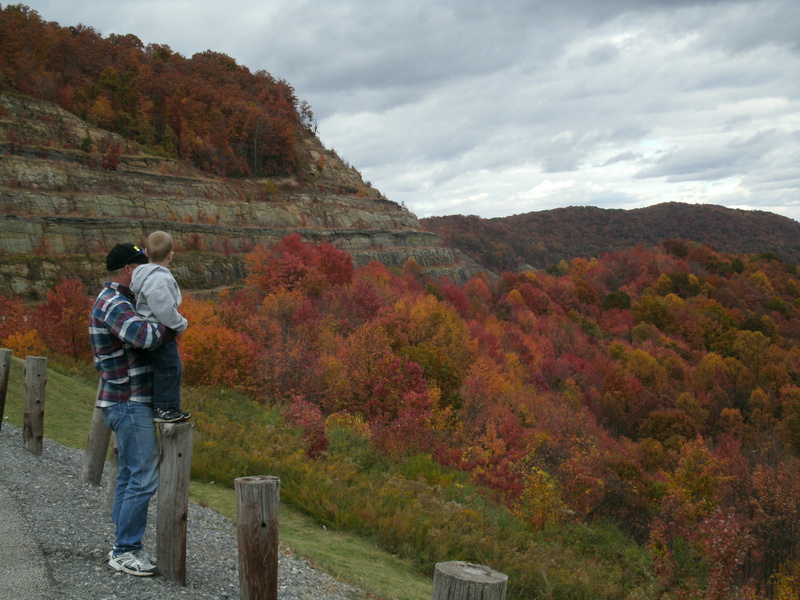 Our families work farms, fall timber, mine coal, manage natural gas lines and wells. We hunt, fish, forage, farm and garden to support this way of life. Many live in tiny towns and hamlets that are lost to cell phone service and are more than an 30 minute drive to a shopping mall. 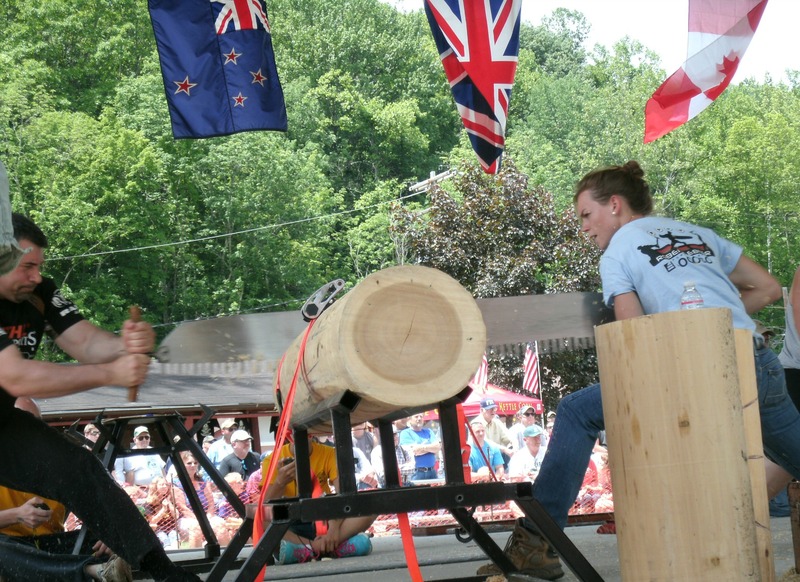 It is in here in the Appalachian Mountains that the WORLD (yes, I do mean World) converges every year over Memorial Day weekend to see who is really the best at their chosen forest craft. 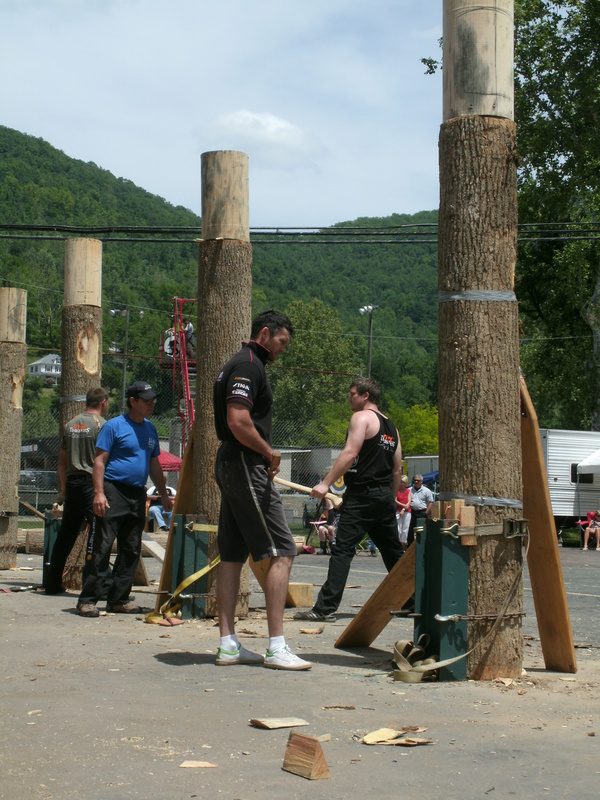 The Wood Choppers Festival is a way for anyone interested in forestry, logging, milling and history to enjoy the company of over 150 men and woman who call the Logging life style a passion. 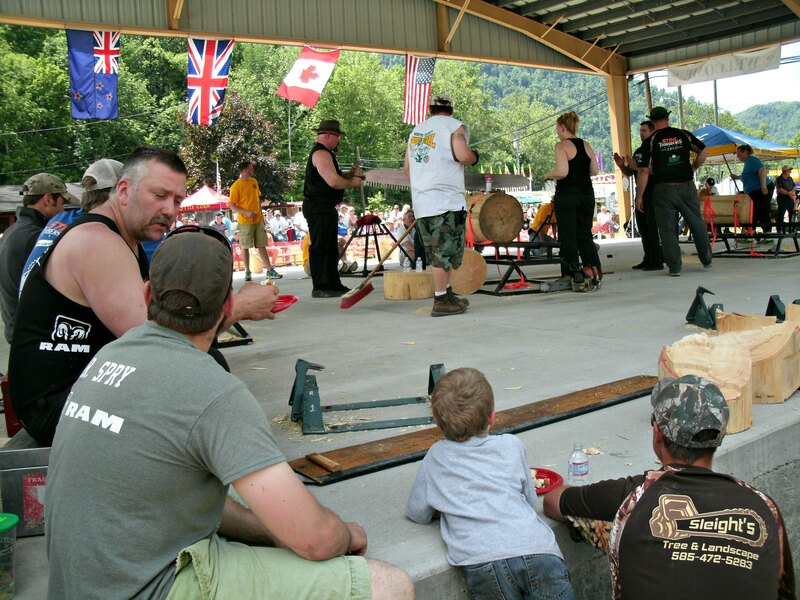 This year is the 50th anniversary of the Wood Choppers Festival held in the remote town called Webster Springs, West Virginia. 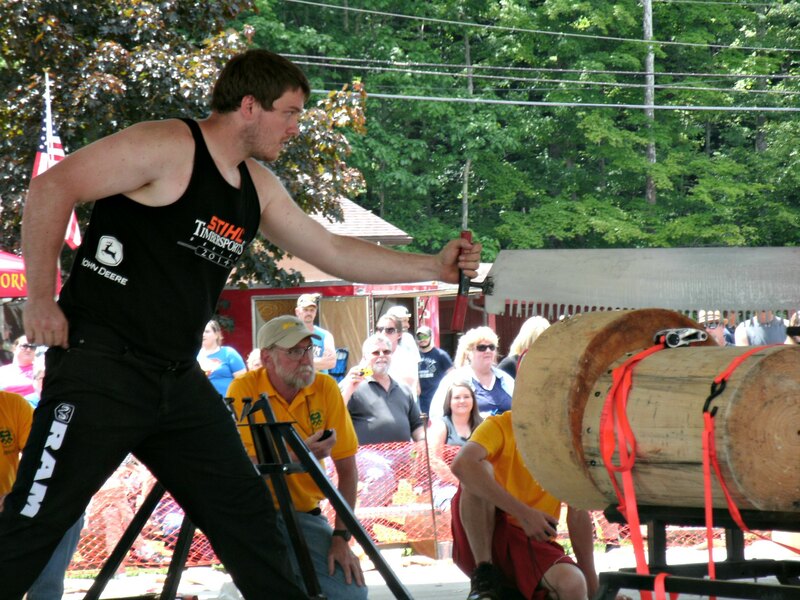 This festival is full of axes, saws and fun that show cases the very best of the logging world. Contestants travel from all over the world to spend the weekend competing and sharing their love. The front man in the above photo is a world champion in this event (Spring Board) and travels here every year from Australia. 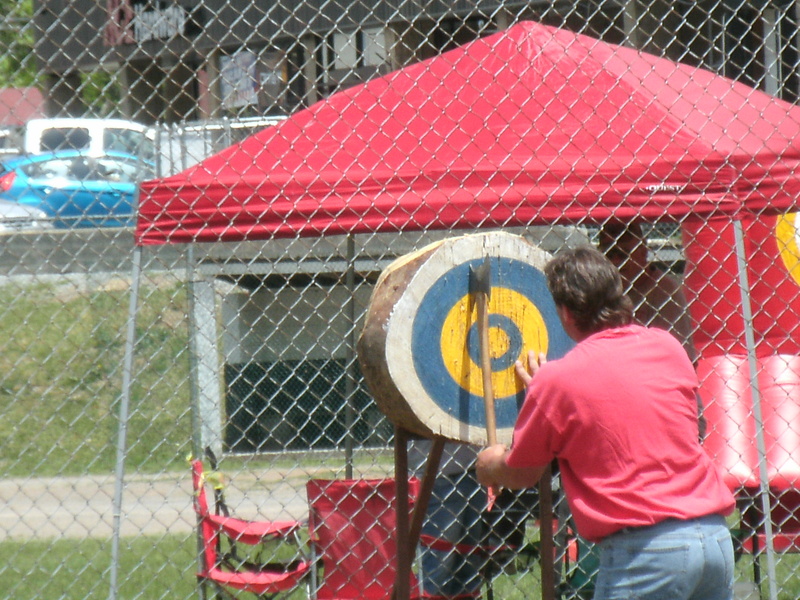 Many of them come from Canada and Europe to see who can really be a modern Paul Bunyan. This is for any one who does not know the American Folk Tail character Paul Bunyan and for those who remember seeing this as a kid. I think it is funny that in the song “Paul Bunyan” playing throughout the video Paul is only 6′ 3″ and the man in the above photo is the tallest competitor at 6′ 5″ and a leaner version of Paul. 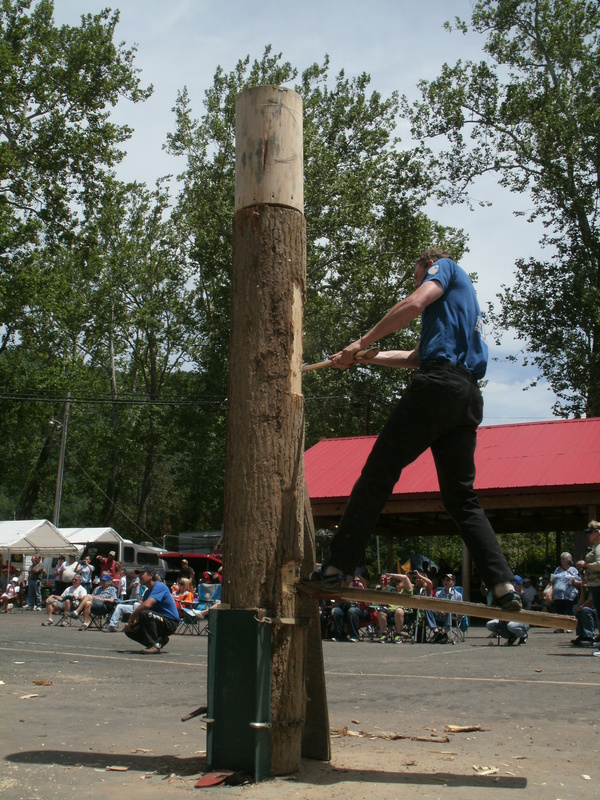 The final day begins with an ax tossing contest and continues through out the afternoon with the standing log, Hot saws and the two-man cross-cut saw contests. Then after the competition many of the choppers visit with the fans, share hardy hand shakes and spend time telling tall tails to one another. At end of the long day the winners of the “World Titles” get announced and awards are given. 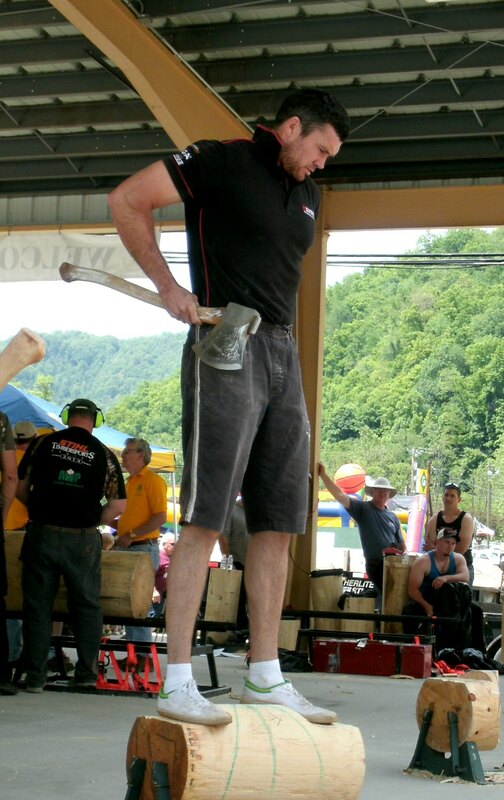 Today the over all world Champion was actually a local young man from Webster Springs, West Virginia, Mike Cogar. 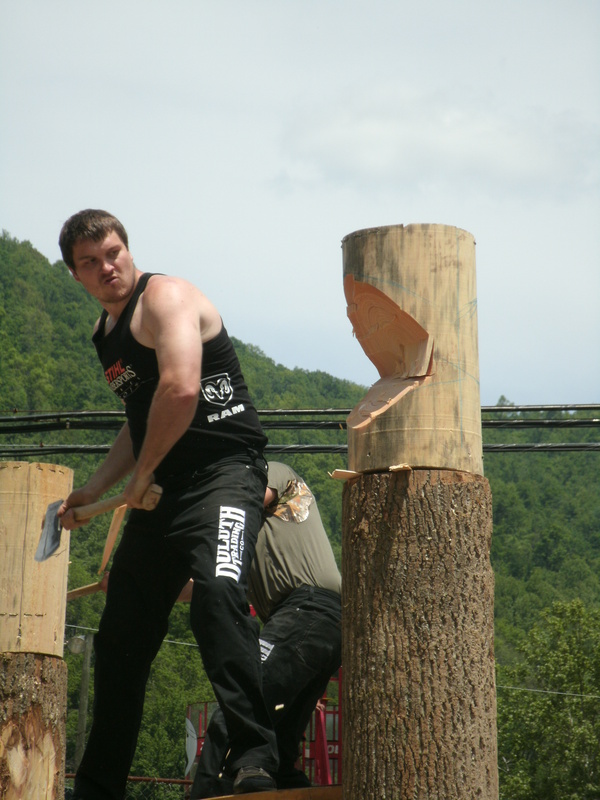 He comes from a long line of wood choppers who were born and raised in the mountains here. 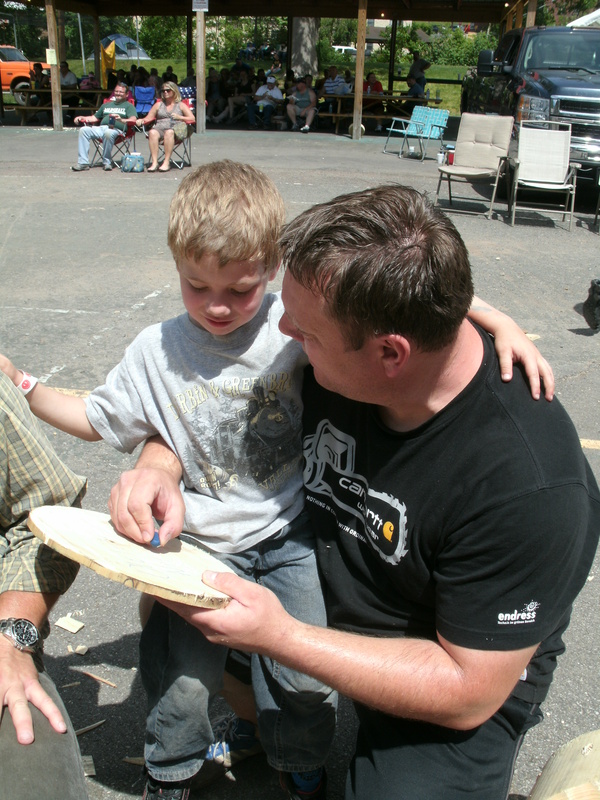 Just like Tom and his Grandfather the love of the woods passes from one generation to another. 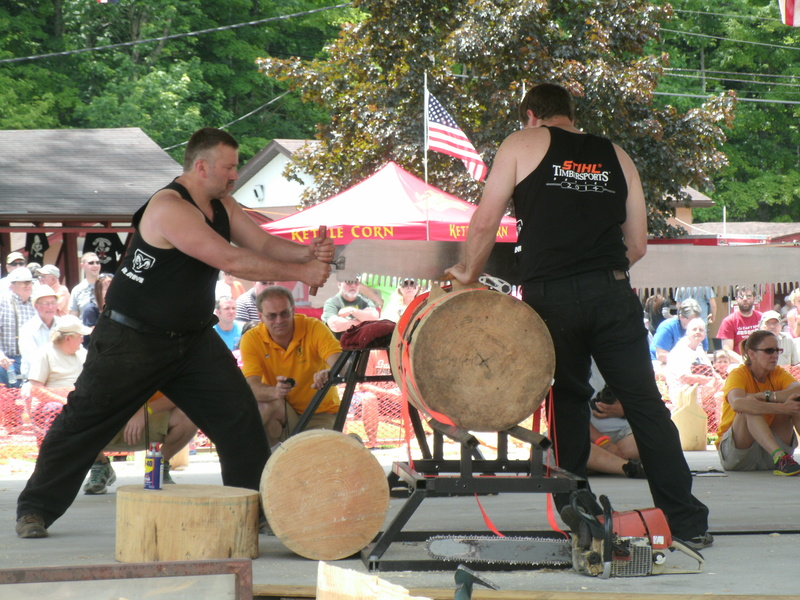 Mike and his world-renowned family(both his father and grand father are world champions also) have been major supporters of this tiny town and this competition. It was such a pleasure to met them and share a day with all the wonderful people of this mountain town. It was wonderful to learn more about what it must have been like for my husbands grandfather who worked and lived in the timber camps at the turn of the century. 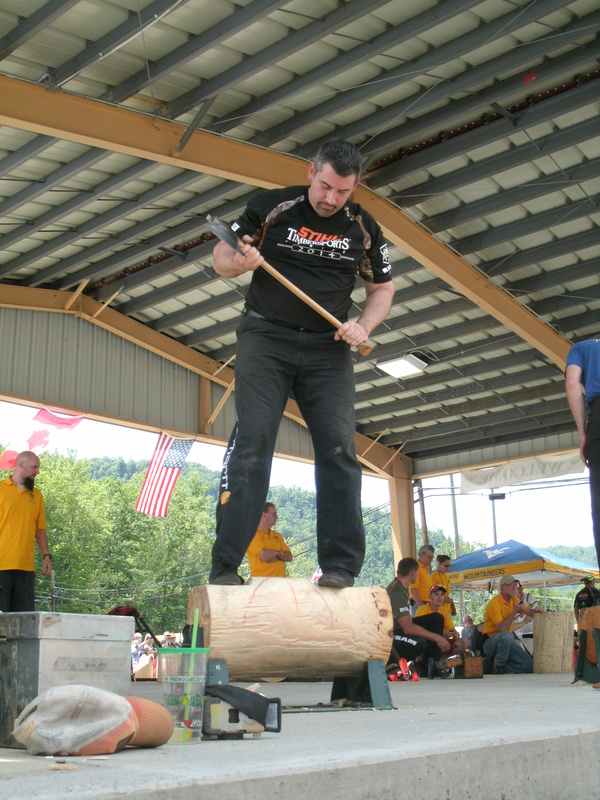 Working with more axes then saws and trying to cut the big timber down to size.The spirit of Paul Bunyan is alive and well here in the woods of West Virginia.